In this issue: Not-so-safe space, a mother’s vengeance, and a clash with the gods. Plus, a new contest! Luck runs rough around Theo Waitley. After narrowly escaping those who would see her dead, her crew arrested, and her self-aware ship Bechimo captured, Theo and her crew find themselves in need of some much deserved rest. Fortunately, Bechimo knows just the place where they can lay low and enjoy some R&R, an area known as “safe space.” But safe space may not be so safe. It seems things are leaking through from another universe, including a battleship fleeing a long-lost war in dire need of help. Now, Theo has a choice to make. It seems that safe space is about to become deadly perilous. Get The Gathering Edge here. The genetically engineered Mules left Earth in disgrace, fleeing for their lives after worldwide revolution against their dictatorial rule. Now, generations have passed and the Mules have returned for their vengeance. It’s up to former darkship thief Athena Sinistra to find a way to stop them. It’s not like it’s the first time Athena has fought her way to victory, but this time is different. This time she’ll have to do it while taking care of her newborn child. Athena must risk herself, her husband, and her child to prevent the extinction of humankind. It might seem as though all is lost, but the Mules are be about to find out that true revenge is one angry mother. A Clash with the Gods Themselves. For eons the ancient race known as the Old Ones have been thought dead. 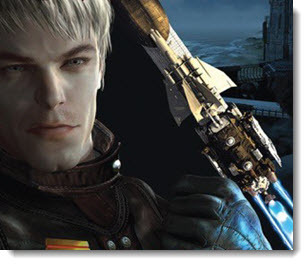 But when a holy site on an alien planet is found destroyed the method of destruction points directly to the Old Ones. 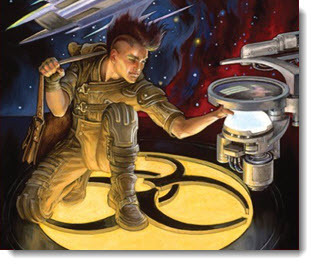 Meanwhile, in another section of the galaxy, humankind’s most brilliant savant and his bodyguard go in search of the secret to the Old Ones’ technology—technology that may be indistinguishable from magic. Now human adventures and an alien shaman are on a collision course with the truth: despite their many differences, only if they unite their forces do they stand any chance of surviving the coming encounter with—THE GODS OF SAGITTARIUS. Get The Gods of Sagittarius here. Sarah A. Hoyt’s latest novel in the Darkship series, Darkship Revenge, features one tough mother, who must risk all to save her child—and humanity. And of course May 14th is Mother’s Day here in the U.S. (Don’t forget to call Mom!). This confluence of events made us wonder, who is your favorite mother from science fiction or fantasy? 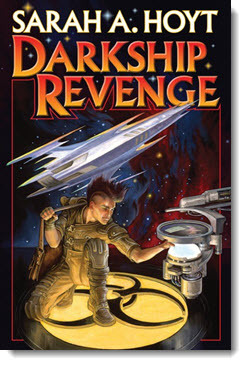 Let us know in a short paragraph (100 words or fewer) for a chance to win a signed copy of Darkship Revenge. Last month, we asked you to tell us 3 things you’d have to bring with you if you were going out into the depths of space and never coming back, for a chance to win a signed copy of Blood Enemies. Congrats to Kelly Jensen! Read Kelly’s list, which includes a clever plan for returning to Earth, below. 1. A copy of any book in the Vorkosigan saga. Doesn't matter which one I grab while I'm packing. 2. Can I take my family? If not, a picture of them. 3. A package of Tim Tams, because once the aliens who find me wandering taste them, they'll bring me back to Earth to get some for themselves. Hopefully they're nice aliens, if not, it'll make for a great story! 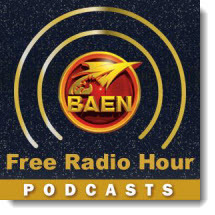 Coming soon to the Baen Free Radio Hour: Larry Correia on the signed leatherbound edition of Monster Hunter Vendetta and a discussion of the Monster Hunter series origins both on and off the page. 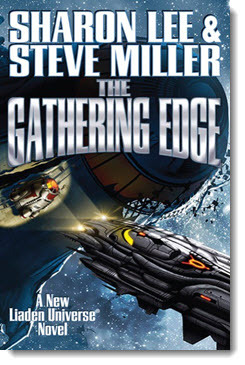 And Sharon Lee and Steve Miller talk about the latest addition to the Liaden Universe® series, The Gathering Edge. Missed past episodes? No problem. We’ve got every episode archived for your listening pleasure. A rip in the fabric of space and time causes a battleship fleeing a long-lost war to materialize in an area known as “safe space.” But with a hostile enemy hot on its tail, safe space won’t be safe for much longer. 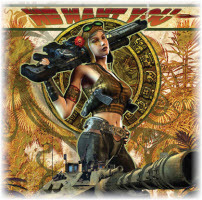 Theo Waitley must take sides in a war, the consequences of which she can scarcely imagine. The aliens known as the Old Ones have been thought dead for eons. A recent attack on an alien holy site calls that into question. 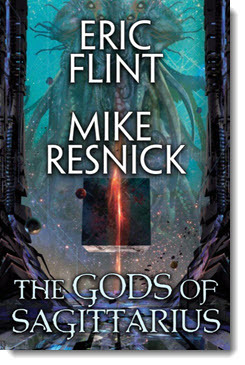 Now, a pair of human adventurers and an alien shaman are on a collision course with The Gods of Sagittarius. The bioengineered Mules are back and they’re out for revenge. Athena Sinistra has faced down enemies before and emerged victorious. But this time is different. Now, she’ll have to prevent the extinction of the human race—and care for her newborn child at the same time. In the near future, a fluke of quantum mechanics renders CIA agent Nat Morgan utterly forgettable. Now, Nat must team up with an enemy agent and a brilliant physicist to stop a ruthless billionaire from finishing a quantum supercomputer that will literally control the fate of the world. Don't forget to check out the newest ebook releases here. Plus read “Cutting Corners,” a new Liaden Universe® short story by Sharon Lee and Steve Miller here. And read this month’s nonfiction essay, "Chimeras: Science and Science Fiction" by Dan Kobolt here.